It’s only a question of time before you encounter a baking recipe that calls for skinned nuts. Rather than run to the store to get pre-packaged ones, you can now save some time and money by doing it at home. 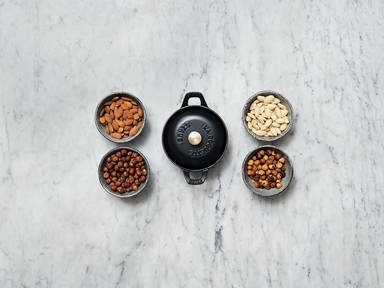 Skinning nuts is not as hard as it first appears to be, and here are two simple ways to ace it! To remove the skin of hazelnuts, transfer them onto a baking sheet. Roast in the oven at 180°C/350°F for approx. 15 min. until fragrant and brown. Remove from oven and let cool until easy to handle. Rub hazelnuts between a kitchen towel to remove their skins. Alternatively, bring water to a boil and let boil for approx. 1 – 2 min. Add raw almonds and blanch for approx. 1 – 2 min. Strain immediately and use your hands to remove skins. Enjoy!